The footage shows the Tube worker apparently threatening to "sling" the man "under a train"
A Tube worker has been suspended after footage of him yelling at an elderly passenger and calling him a "jumped up little git" emerged. The images, captured by another passenger, show the man in conversation with a London Underground steward. The worker then calls him a "jumped up little git" and a "little girl" before apparently threatening to "sling him under the train". Mayor of London Boris Johnson said he was "appalled" by the video. The video was shot by businessman Jonathan McDonald. Describing his version of events leading up to the scene, Mr McDonald said the elderly man had got his arm stuck in the door of the train. We have staff threatening to throw passengers under trains and in return, prices going up. Are we supposed to tolerate this? 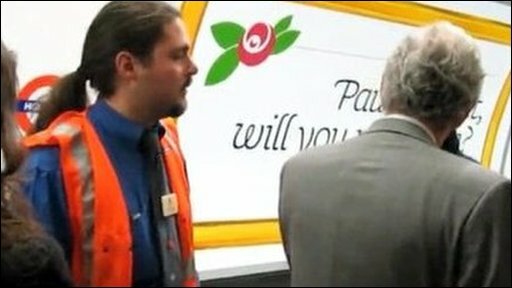 Mr McDonald said when the victim told the Tube worker what had happened, he was sworn at three times in an attempt to make him stand behind the yellow line. Mr McDonald said: "The elderly guy quietly questioned why he had to swear, as did several other passengers. "[The worker] literally screamed in this guy's face. That was when I pulled out my video camera. "Right at the end of the clip you hear him exclaim 'sling him under a train'." Mr McDonald said he thought the incident was particularly bad timing, coming the day after Mayor of London Boris Johnson announced price increases on the Underground. He said: "So we have staff threatening to throw passengers under trains and, in return, prices going up. "Are we supposed to tolerate this?" Mr McDonald continued: "At the end of the clip you see the look of utter disdain from the female guard. "I said, 'he will lose his job for this'. "She laughed and walked away in the assumption that we have no power." A TfL spokesman said: "We are appalled by the scene captured in this video and will investigate thoroughly and urgently what took place and what led to it. "We do not tolerate members of the public being abusive to our staff but neither will we tolerate members of our staff abusing members of the public." Boris Johnson put a response on Twitter: "Appalled by the video. Have asked TfL to investigate urgently. Abuse by staff is never acceptable."